Thank you, Jonathan for the very kind introduction, and thank you, as always, Dr. Boaz Ganor, for the opportunity to address the Summit again. Thank you, Dr. Reichman for your leadership of the IDC. I’d obviously like to start by recognizing the International Institute for Counter-Terrorism at IDC. For its commitment to investigating and identifying terrorist trends, and for bringing together experts such as yourselves to share experiences and information, to assist law enforcement officials and policy-makers in their work. 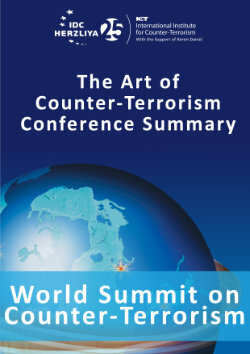 Summits such as these help create the networks, both on an academic and operational level, needed to assist homeland security officials and counter-terrorism experts to stay ahead of the terrorist organizations. So, I am very honored to be here. Obviously also honored to be here with former Prime Minister Ehud Olmert and Manhattan District Attorney, Cyrus Vance, Jr., both of whom know all too well the effects that terrorist attacks have on families, friends, colleagues, and the broader society as a whole, and both of whom have made combating terrorism among their important missions. Today, September 11th, marks the day that the unthinkable occurred. For many of us, our innocence was lost, our sense of safety shattered, and our lives changed forever. On that clear, bright, terrible morning, eleven years ago, nearly 3,000 people were killed in vicious and coordinated attacks on the World Trade Center and the Pentagon, and in a field in Pennsylvania as brave men and women, who fought against the hijackers died in the downing of United Flight 93. There are very few events in history that are recalled, on a global scale, by simply reciting the date on which the event occurred. However, when someone says September 11th, or 9/11, no further explanation is needed. While the attacks occurred on American soil, they touched the lives of people around the globe. With victims from more than 90 countries, 9/11 was not only an attack on America--although it was that-- it was an attack on the values of freedom and democracy that Americans share with so many. The victims were also British and Korean, Canadian and Indian, Dominican and Filipino, Colombian and Japanese. They were from all over the world. And among those killed were also five Israelis: Alona Avraham, Leon Lebor, Shay Levinhar, Daniel Lewin, and Haggai Sheffi. I was honored to join with their families and many other friends of the United States in a moving ceremony at the Karen Kayemet LeIsrael JNF Living Memorial to the victims of 9/11 in Emek Arazim outside Jerusalem early today, I know Prime Minister Olmert had a lot to do with the establishment of. While we remember those who perished on September 11th, we should also remember those who have been killed and injured in numerous terrorist attacks worldwide – in Buenos Aires, Dar Es Salaam , Nairobi, London and Madrid, Phuket (poo-ket) and Bali, Tel Aviv and Jerusalem, and most recently, in Burgas. So I would like at this point to pause for a moment of silence, to remember all of these victims and the many other victims of terrorism around the world. The goal of terrorists is clear – to attack and kill innocent civilians and instill fear in society. Terrorists not only seek to cause immediate panic and mass casualties, they also try to create a long-term sense of insecurity. As chilling an effect as a terrorist act can have on society, however, a true sign of human nature and the resilience of the communities is seen in how we react to such attacks. It is seen in the response of the brave passengers I mentioned of United Flight 93, who, when hearing of the other attacks already underway, banded together to fight against the hijackers and prevent an even larger atrocity from occurring in Washington D.C.—perhaps in the capital where I worked that day. It is seen in the first responders who rushed to the World Trade Center and Pentagon to assist the injured and attempted to evacuate the towers before their collapse, putting their own lives at risk, in some cases losing them. It is seen in the outpouring of international support that came in the hours, days, and months following the attacks. And it is seen in the reconstruction of the World Trade Center and the memorial to its victims currently underway in lower Manhattan. While the terrorists caused us to change our daily routines, being more alert to our surroundings and adapting security procedures to thwart future attempts, what perhaps they didn’t realize, was that their actions would also have a galvanizing effect bringing people together. In the immediate aftermath of these heinous crimes, what is very significant to me, is the way we emerged more united both within the United States, and with many partners around the world. We were of course united initially in our common disbelief of what had transpired. But equally in our resolve not to let the perpetrators continue planning and executing future attacks with impunity. Since then, the United States has relentlessly pursued the leaders of Al Qaida, restricted its operating space and limited its sources of funding. It remains a threat, but it is a weakened organization, and not only because of the operation that took down Osama bin Laden in May of 2011. In the same period, nations around the globe have galvanized forces through bilateral and regional cooperation, and in international organizations such as the United Nations, NATO, and the OSCE. Behind the scenes, governments and Intelligence agencies now work much more closely together to identify threats and thwart terrorist activities – cutting off their methods of financing, infiltrating cells, sharing information, and taking action to both prevent attacks and to bring terrorists to justice. And to counter the terrorist threat, we also seek out and share techniques and best practices. In doing so, many experts from around the world have turned to our friends and colleagues here in Israel to learn from your experience –your bitter experience born of too many terrorist attacks. No other country has had to cope with the constant threat of terror more than Israel. In developing the U.S. response to terrorism, we’ve turned to Israel at all steps in the process. Israelis understand—on the deepest level— just how easy it is for terrorists to instill fear and overturn our way of life. But they also know that this paralyzing reaction, this fearful reaction is exactly what we must avoid to deny terrorists their goal. That is why from airport security, to intelligence matters, to bureaucratic restructuring, we continue to learn and grow from Israel’s experiences. In transportation security, El Al and Israeli Aviation Security experts offered us their hard lessons learned from earlier acts of aviation terrorism in building an effective system to counter such attempts. And the knowledge you have shared with us has helped prevent numerous attacks both on American soil and elsewhere. We have honed our human intelligence – individuals on the ground gathering information and infiltrating cells. We focused on the need to disrupt terrorists in all phases of their work – recruitment, indoctrination, training, and logistical support of terrorist operatives. And we created mechanisms to share information gathered across the board, which is why the United States established the National Counterterrorism Center, and the Department of Homeland Security, which took the functions of over 40 separate federal agencies and gave them one address. The creation of DHS was an effort to match the challenging demand of securing the United States and its interests by better linking those needs with existing offices and personnel. And we have our Israeli friends and counterparts to thank for their guidance in helping us to bring our counter-terrorism defenses up to the new challenges presented by terrorists today. I am very proud, serving in this post as the United States Ambassador in Israel, that in recent years our security relationship with Israel has become broader, deeper, and more intense than ever before. We hold regular high-level dialogues across the security spectrum, and our technical-level experts have open lines of communication with their Israeli colleagues. We know that many of the threats the United States faces are also threats to Israel. It’s equally true that many of the threats Israel faces, are threats to America as well. Our partnership with Israel ensures that in the face of terrorism, both our countries are stronger and our citizens are safer. And we recognize that Israel is constantly under threat – be it Hamas and global jihadists in the south, Hizballah in the north, Iran from the east, or a combination of international terrorists and their proxies abroad. That is why we continue to work on innovative technology to combat this threat and to ensure that we are using science and technology to our best advantage. That is also why, in addition to the over $3 billion in military assistance that the U.S. provides Israel annually, we also continue to work closely on new developments in missile defense. Today, our unshakeable alliance is aimed at countering and defeating these threats. The threat of terrorist organizations who fire missiles at civilians. The threat of extremists who seek to wreck peace treaties, and perpetuate conflict. And the threat of the terrorist-sponsoring regime in Iran, acquiring a nuclear weapon. An Iran armed with a nuclear weapon, is an unacceptable threat to Israel, to the United States, and to the entire world. Make no mistake about our determination to prevent that threat from being realized. This past decade has shown us that the universal pursuit of dignity and freedom is stronger than random acts of terror. Americans and Israelis alike have, in their daily lives and activities demonstrated time and again that democracy and civic engagement far outweigh the power of terror. And by adjusting our national security methods to track and counter terrorists, we are now better prepared to prevent attacks before they occur. In so doing, we have created an atmosphere whereby our citizens can continue with their daily lives without fear. Speaking on behalf of the President, of the United States Government, and the American people, let me offer my deep appreciation for the unwavering support Israel and the Israeli people have provided to us in our fight against terrorism. You have stood by us in our darkest hours and you can be confident that you will find us by your side in your times of need. I wish everyone a good, sweet year, a year of health, happiness, success and blessings and a year of security and peace. Thank you.